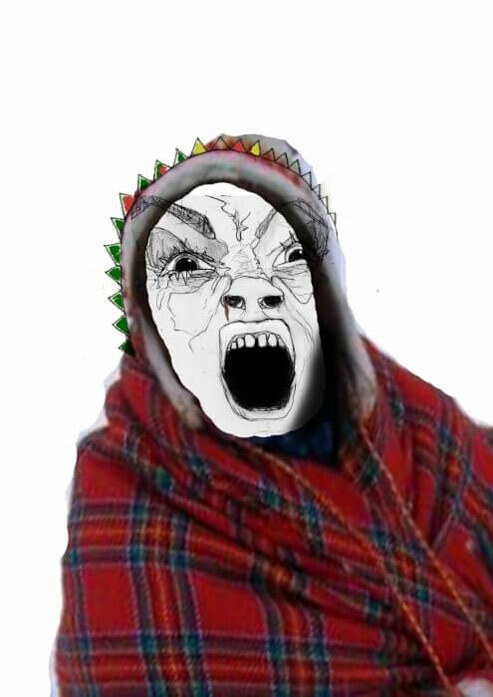 There is no post colonial! There is no post colonial! Pile o´Sápmi GIF campaign made for Pile o´Sápmi-Supreme in Oslo, december 2017. Pile o´Sápmi, installed outside the Inner Finnmark District Court, Tana, February 2016. Jovsset Ante Sara, the artists little brother goes into court to defend his reindeer, his traditional way of life, his livelihood and income, and his families ancient inherited rights. The Norwegian government has activated forced culling of the Sami peoples reindeer and they are forcing Jovsset Ante Sara to slaughter his herd to 75 reindeer. Sara claims that this will force him to bankruptcy and thereby force him away from his traditional way of life, his culture and the families ancient inherited rights. The system of the forced slaughtering is affecting great loss for many individuals, especially for the smallest reindeer herders such as the youth who are in the establishment phase. A whole society is affected, the recruitment of Sami reindeer herding is being efficiently strangled and a whole culture is threatened. Sister Maret Anne Sara piles up 200 raw reindeer heads outside the courthouse to get attention, public awareness and critical debate around the case. 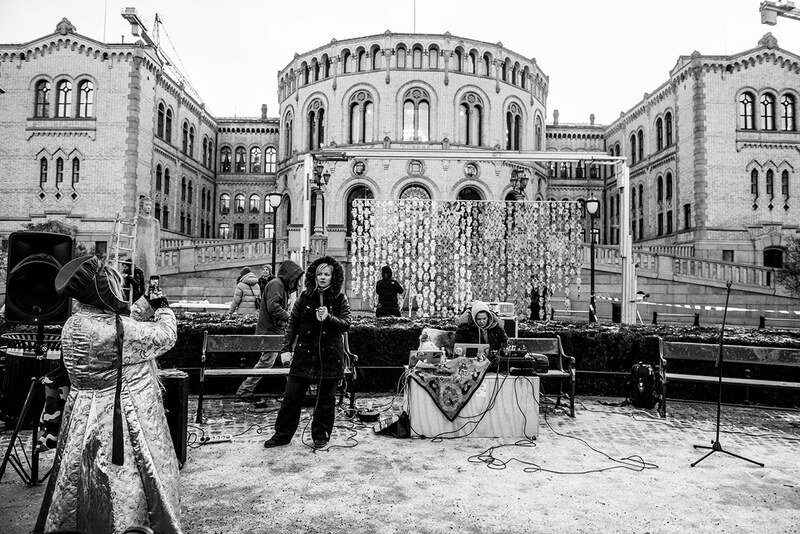 09 AM, as Jovsset Ante Sara entered the Norwegian Supreme Court, sister Máret Ánne Sara gathered artists and activists to Oslo and raised the Pile o´Sápmi-Supreme installation outside the Norwegian Parliament. 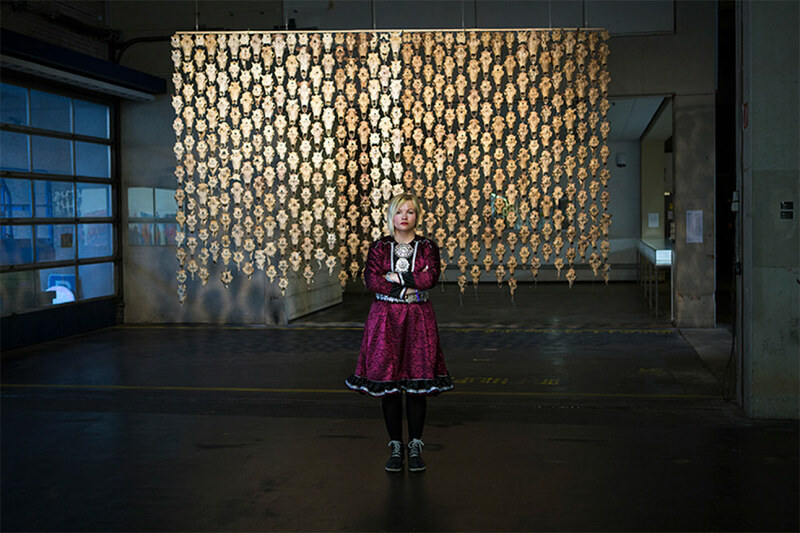 The curtain made of 400 bullet ridden reindeer skulls, hung publicly in the power center of Norway during the two days of trial, as support for Jovsset Ante Sara and other reindeer sámis who end up with enormous burdens because of misappropriated policies. Also to signal to politicians and people that politics and law cannot freely be adjusted according to state interests, regardless of the people, culture and rights that the Sami people are entitled to in the same way as everyone else. Artist Maret Anne Sara is especially adressing the new colonial systematical practices taking place in fair democracies such as Norway. Pile o´Sápmi at Documenta 14, Kassel 2017. 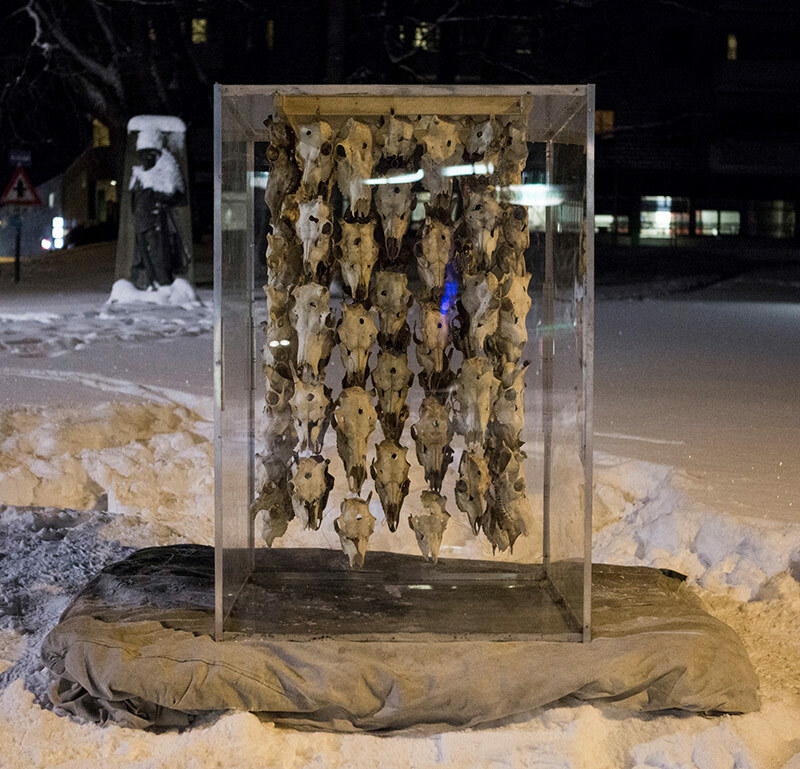 The piece of 400 bullet ridden reindeer heads, hung up as the Sámi flag, was later raised outside the Norwegian Parliament as Saras brother entered the Norwegian supreme court for the final decission of his case. After two victories and two serious verdicts stating abuse on the young reindeerherders human rights and indigenous rights, the Norwegian supreme court rejected the existing legal argumentations and went in favour of the States political arguments. Sara lost the case. 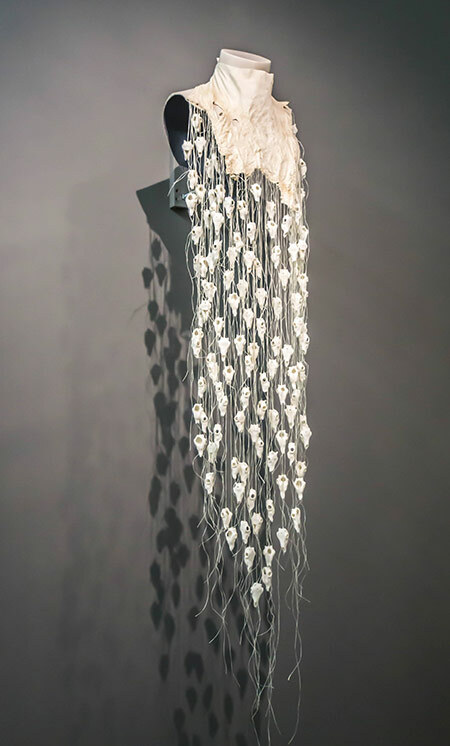 Mother Earth 2015: The gietkaboallu/komsekula is a silver amulet that you find hanging on most baby cots or carts around Sápmi. 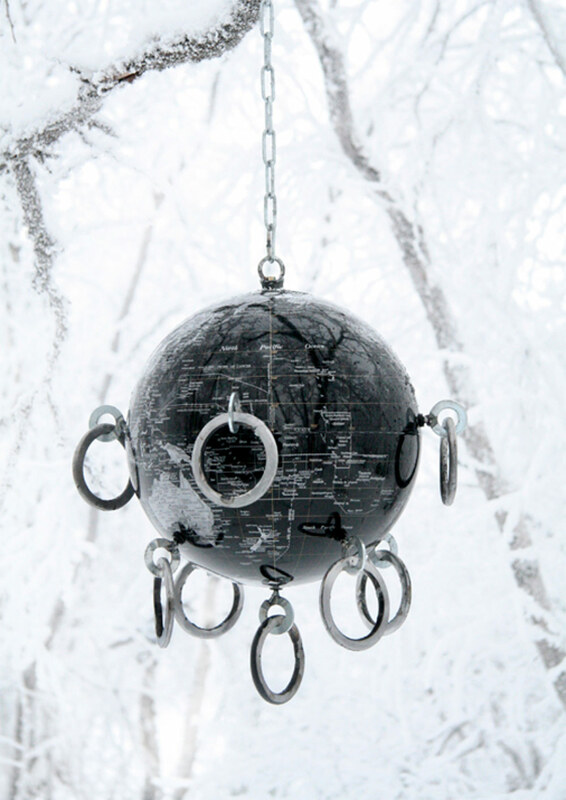 The amulet is considered in Sami cultural context to have a protective force. Oaivemozit/Madness/Galskap 2013: Reindeer herders in the Nordic regions are gradually being pressured out of their lands due to industrial establishments and growing infrastructure for the growing society – a process that threatens the existence of the Sami people and their culture – a political madness that has occupied Máret Ánne Sara for years. Originally from a reindeer herding family she asks, who is mad? The Sami communities foreseeing a world on the brink of destruction? Or the people denying the drastic consequences foreseen by the people affected? 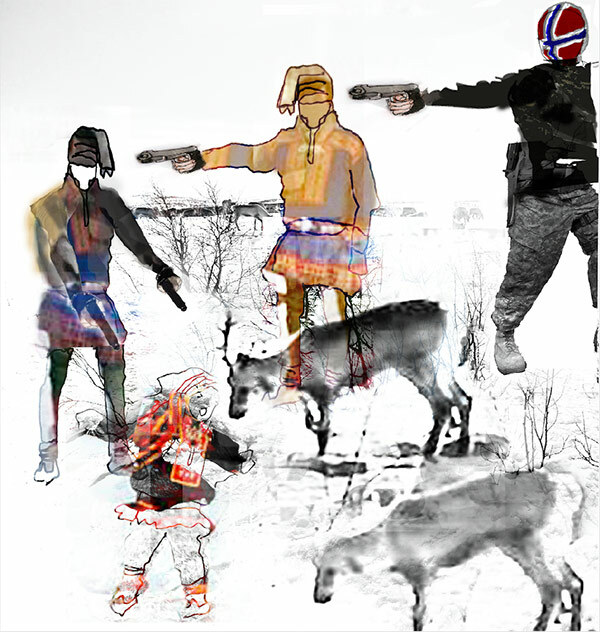 The Norwegian Hunger Games, 2016: A part of Saras work related to Pile o´Sápmi and the «Oaivemozit/Madness/Galskap» series from 2013. A visual portrait of how the Norwegian governments model of the forced reindeer cullings are affecting the Sámi society internally. The Norwegian authorities have set a maximum number of reindeer in northern Norway, based on calculations of optimal meat production. This means that a certain percentage of the total reindeer population is to be slaughtered in the largest Sámi reindeer herding area. Officially, the Norwegian government claims that the sami reindeer herders had –and exercised self- determination in the reduction process. This so called “inner-self determination” came into effect only after the government had set the total number of animals to be slaughtered, leaving the reindeer herders only to decide who amongst the reindeer herders was going to slaughter and how much. Any internal reduction model by the reindeer herders, was only accepted if it was an unanimous agreement, signed by all reindeer herders representing a siida-share. A siida-share includes many reindeer herders or reindeer owners within a family, meaning that any siida-share had to agree internally on a reduction-split before negotiating with the other siida-share representatives in the district. This so called “inner self determination” has left people quarreling over private properties of each other, and ultimately also over fundamental cultural rights of individuals. Not surprisingly, this effort achieved little results but caused high level of stress and internal conflicts - and lawsuits within the reindeer herding society and families. Once herders failed to meet the impossible requirements of unanimously signed agreements, it was officially stated that the reindeer herders are “incapable” of self determination and the government formally legitimized an overtaking of the process of setting a forced reduction model. The forced reduction model implemented by the government required all siida-shares within a district, slaughter the same percentage of their herd, regardless of how many reindeer each individual siida-share had initially. The process was effectively a form of collective punishment—disproportionately affecting the smallest herds, such as those of young herders establishing themselves, and thus also recruitment into the traditional livelihood. Before implementing the forced reduction process, the Norwegian parliament unilaterally modified the national Reindeer Herding Act, adding a whole chapter about legal punishments and forced measures against herders who do not voluntarily slaughter their herds down to the level the government has determined is “sustainable”. These constitutional changes were made despite strong objections from the Sámi Parliament and the Norwegian Sámi Reindeer herding association. 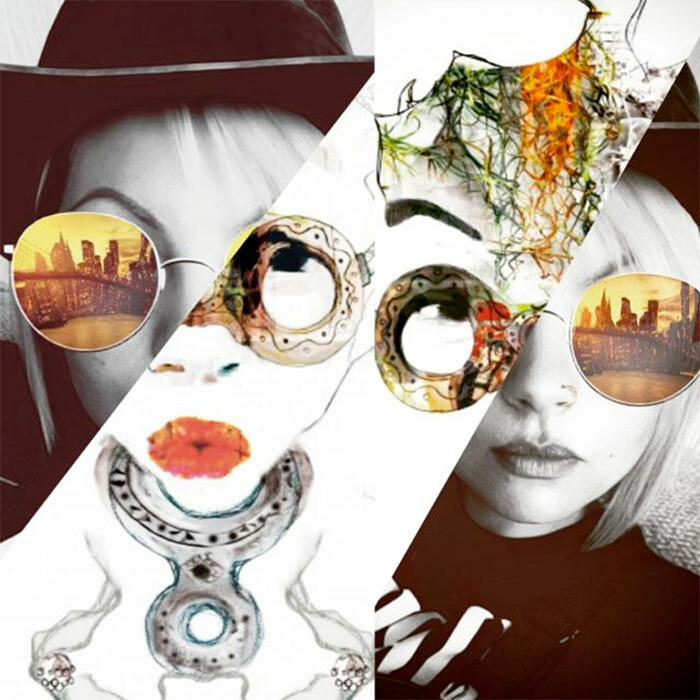 Snapchat selfie: Saras play with the digital now and the digital as a tool.